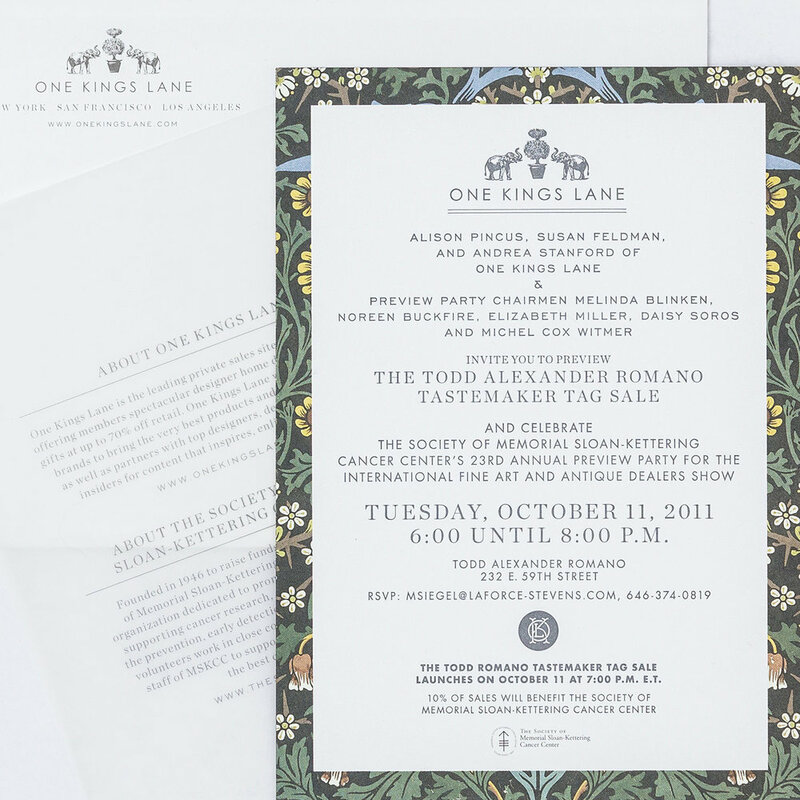 As Senior Designer at One Kings Lane, I worked on everything from email templates, editorial content, an iPhone app, site design, branding, packaging design, print design, and campaigns. Below are a few of my favorite projects. I envisioned this site to be simple and modern, with a subtle tactile element to it to convey the warmth and richness of the beautiful merchandise made out beautiful materials including bone, shell, leather and metals. The top nav directs viewers to the different categories on the site, while the large slideshow directly beneath gives viewers a chance to scroll through the people pieces in context. below "must haves" are called out- drawing attention to a handful of curated favorites. 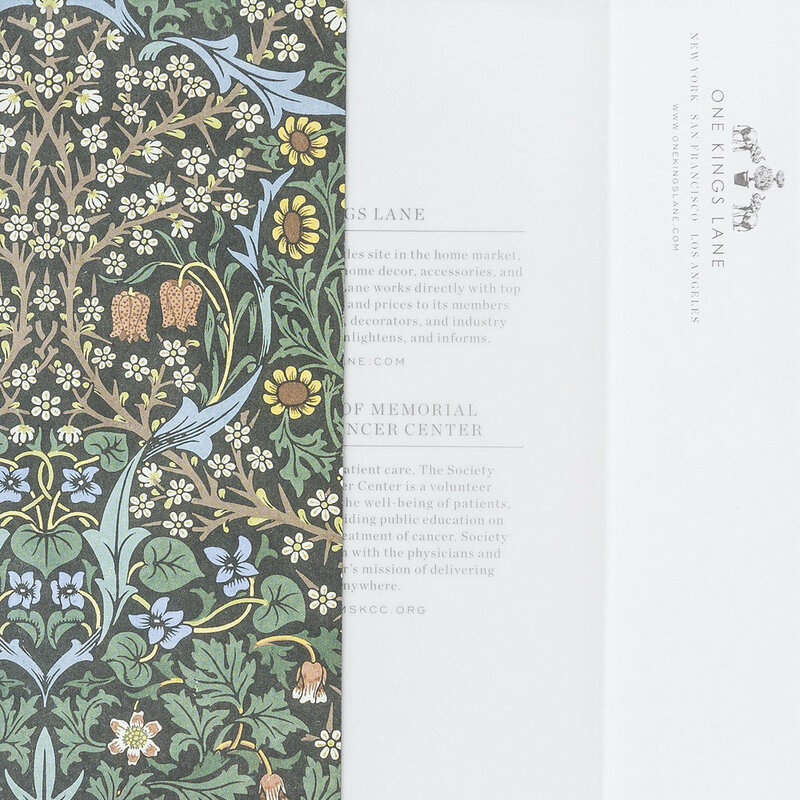 A large part of my role at One Kings Lane was designing stationary and invitations to various events, promotions, and parties. 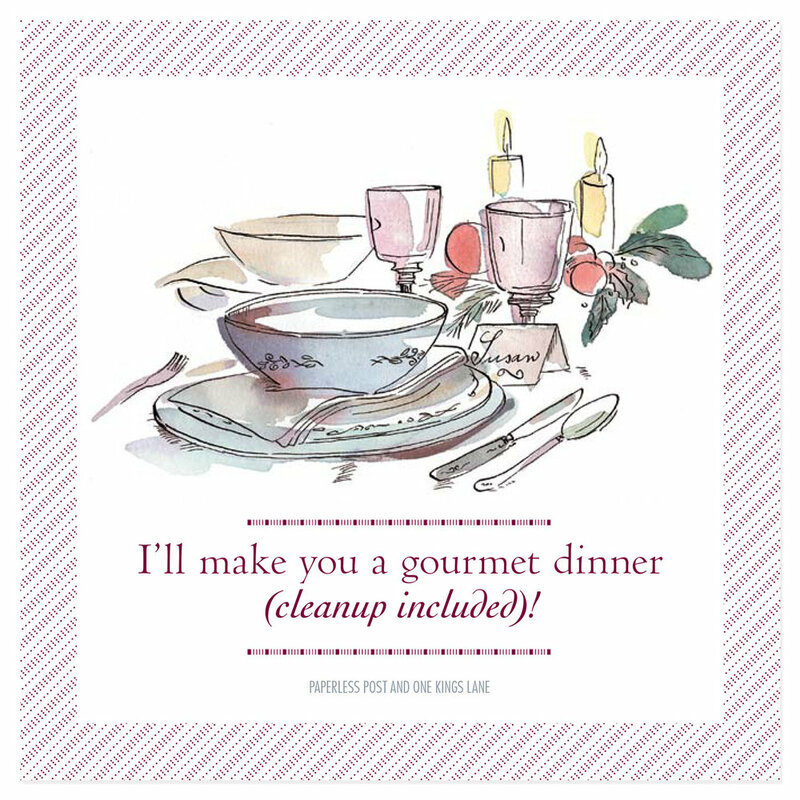 This card was designed for VIP customers to accompany a gift of thanks for a year of support to our site. My inspiration was to create a card that had an interactive quality to it, so I decided to do an “ornament” that could be hung on a tree or placed somewhere in the home around the holidays. I wanted the card itself to feel like a gift. I drew inspiration from non-traditional wreathes that weren’t overly “holiday” and took varies elements of our logo and subtly incorporated them in the overall design. I worked with the talented Richard Phipps, who illustrated the wreath, which was then laser cut and printed on both sides with metallic silver ink. 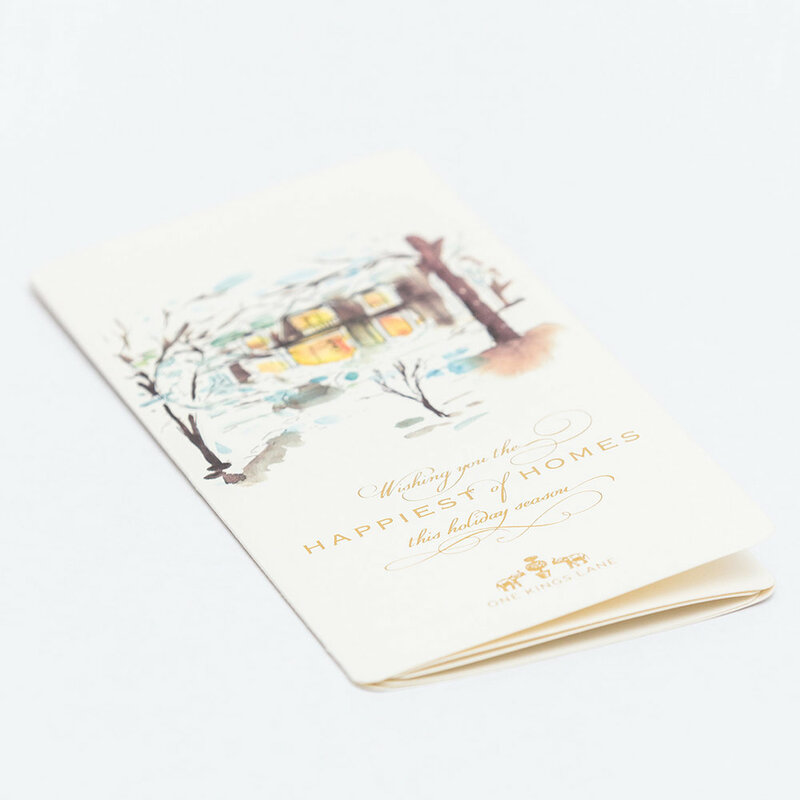 Behind the card, there was the card itself, a square piece, unprinted on one side which lay against the wreath, and on the other side, printed in the same metallic silver with our holiday messaging. In addition to the holiday card for our customers, we also wanted to create one for all of our vendors, contractors, <i>etc</i>. The concept I developed for this was to create a card that would acknowledge all areas of our business—from art to furniture to kitchen ware and everything in between—I wanted a card where everyone in the company would feel represented. I developed this card to be an 8 panel roll fold, with gold metallic foil stamped typography and illustrations commissioned by Lucile Prache. Created branding for online holiday cards with a different outlook—instead of giving a gift or writing a sentimental note, friends and family can give the gift of their time through a free digital e-card delivered by the very chic Paperless Post. For this project I created the logo, the look and feel of the cards, and art directed a wonderful illustrator, Lucile Prache, to perfect the vision of each “gesture”. Senior Designer. Designed landing page (shown) and packaging design and labels (not shown).